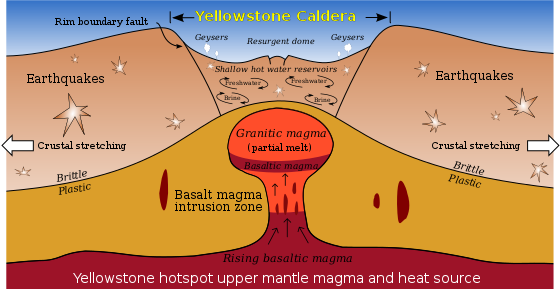 Yellowstone National Park contains a caldera of a supervolcano that measures 35 X 45 miles. 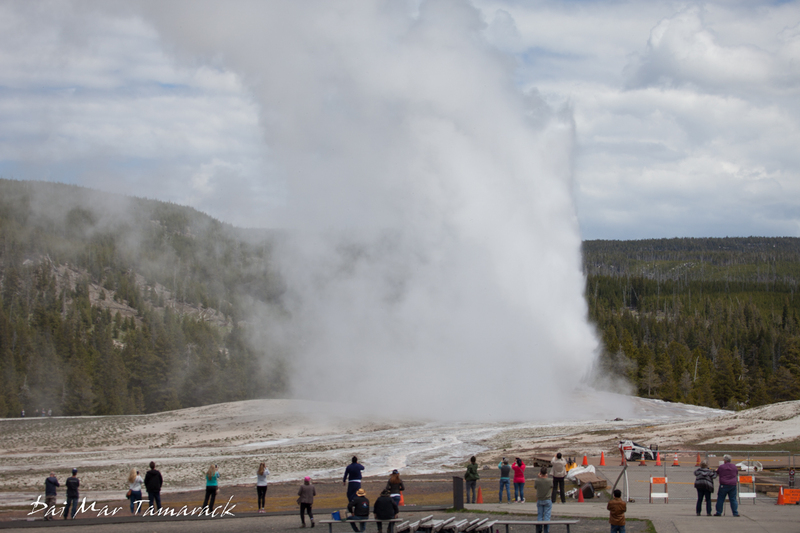 All kinds of geothermal activity can be seen here from steam vents, to hot springs, to geysers. It is caused by the movement of the North American Plate slowly sliding over a hot spot...very similar to Hawaii. 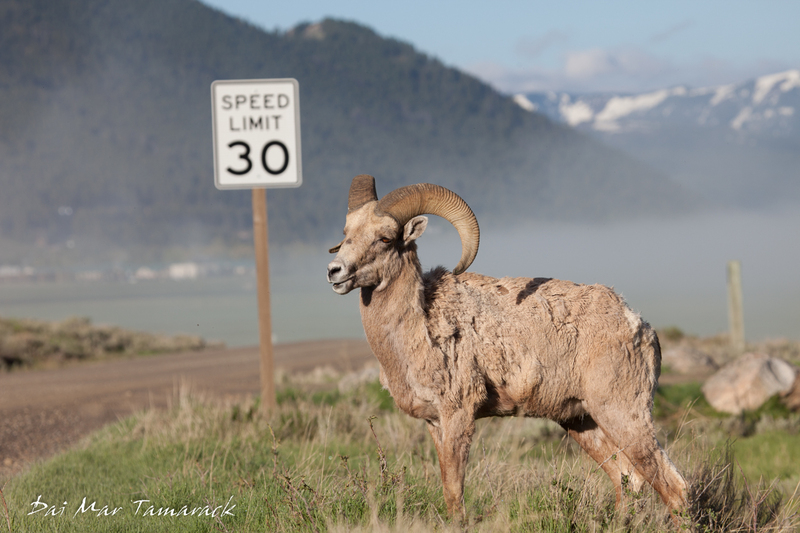 Driving around Yellowstone and seeing the wildlife mix with the volcanic activity, it is no wonder that it was destined to become our first national park in 1872. 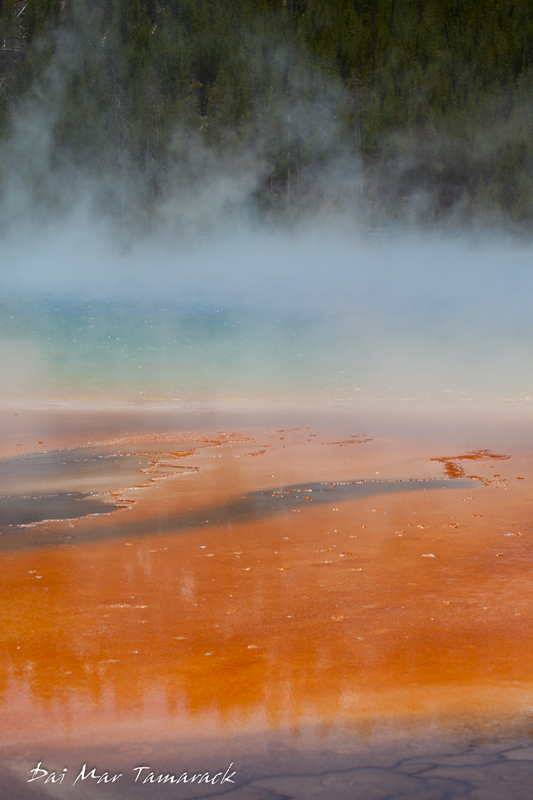 The extreme temperature of water in the geysers and hot springs create a unique environment for colorful extremophiles, bacteria that survive and live in the scalding water. 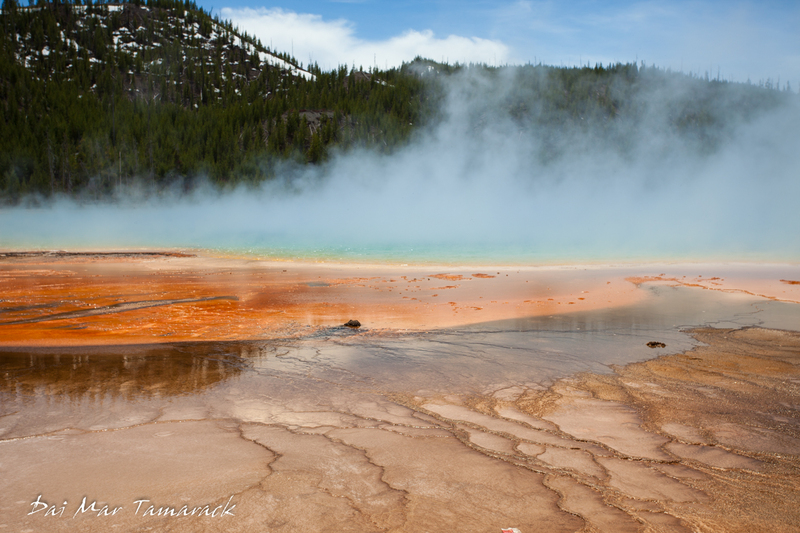 The bacteria can be quite colorful, making the springs very picturesque.Some pools were bright orange while other were a greenish blue, while some had just about every color you could imagine in a bright rainbow array of colors. 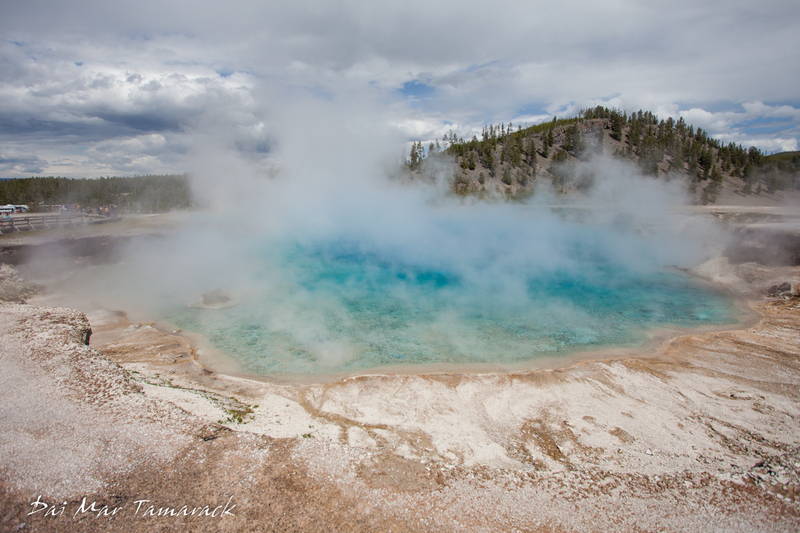 Most of my best photos came from an area around the Grand Prismatic Spring. 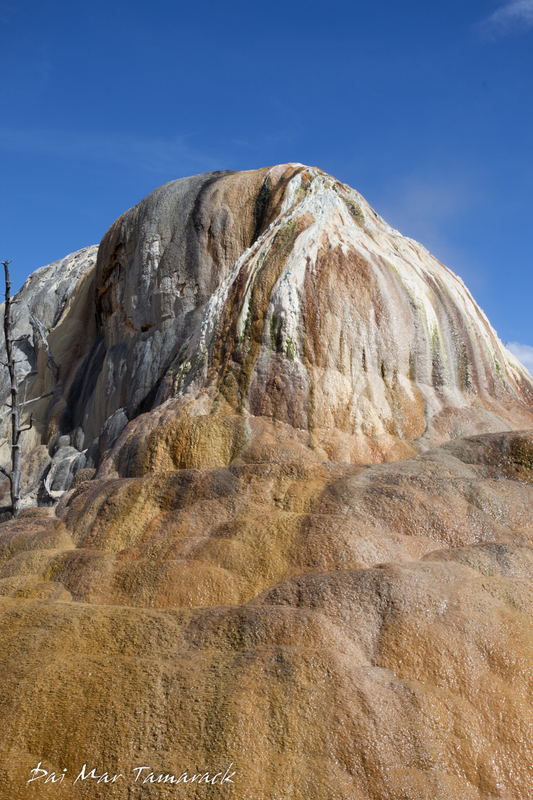 It is the largest hot spring in the United States. 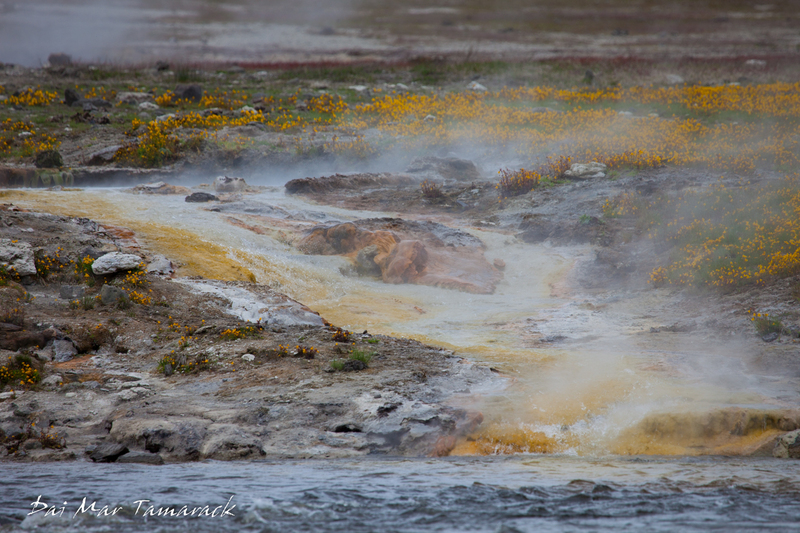 There was quite a bit of steam blocking the view of the entire spring but the colors still came through. I think the steam added a bit of mystery to the photos which I like as well. I had to watch out while walking around the springs as the steam is corrosive to delicate equipment...like cameras. The afternoon rain clouds were starting to build up which provided a great background for landscape shots. 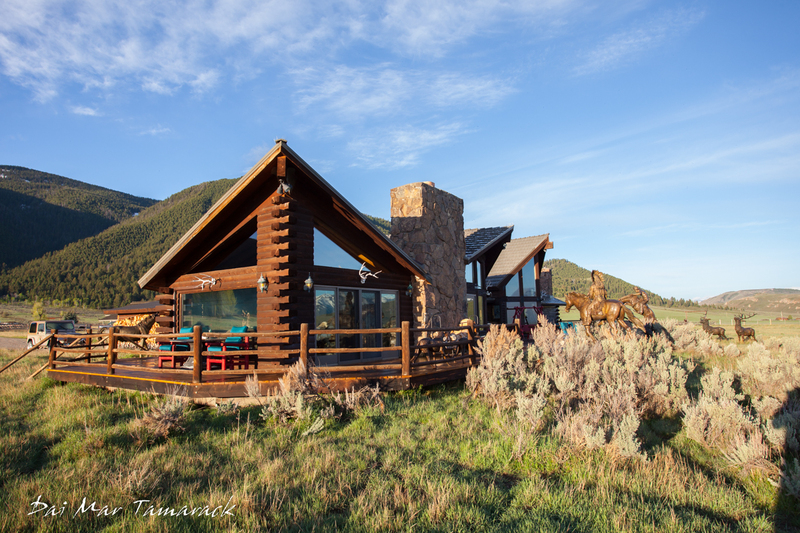 These beautiful and unique sights alone would make Yellowstone a must see destination, but add all the wildlife to the mix and now you have a place that you could come back to time and time again. It was interesting to try and count the different languages being spoken around us as I explored the park. 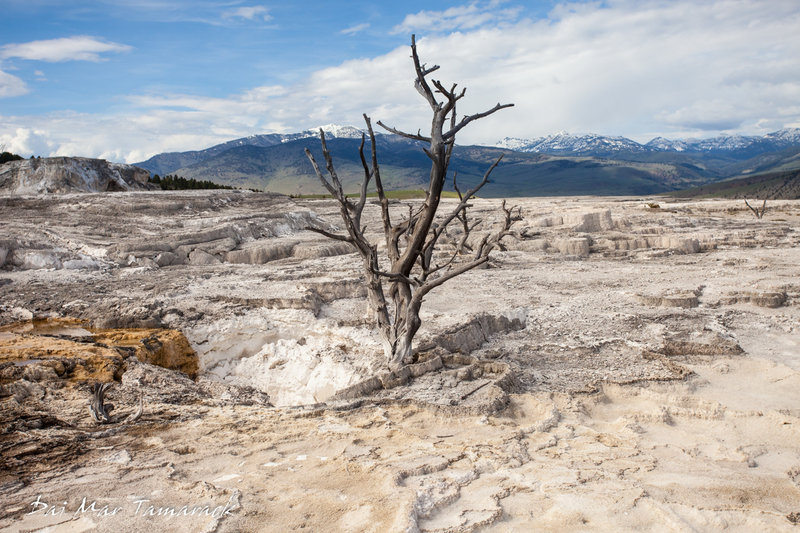 Another unique geological feature is located in the northwest corner of Yellowstone, called Mammoth Springs. 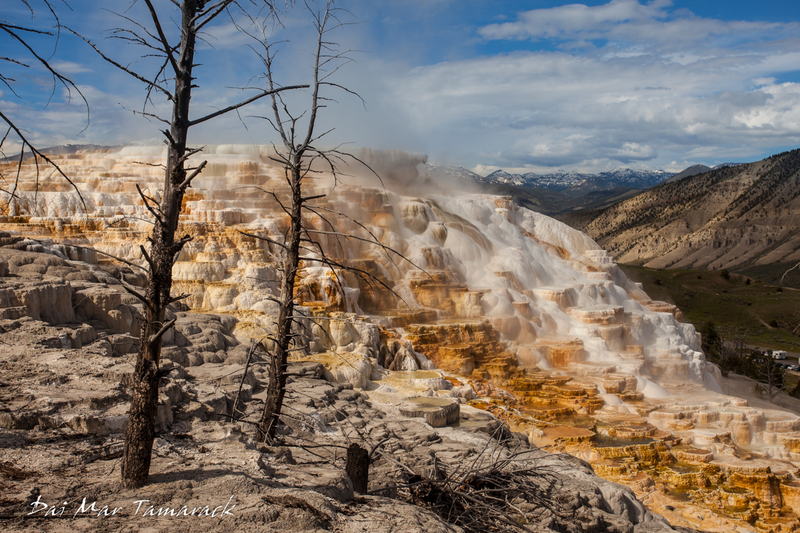 This is a large complex of hot springs on a hill of travertine which tumbles down forming a terrace of white and orange. It is algae living within the 170 degree water that gives these hot springs its color. 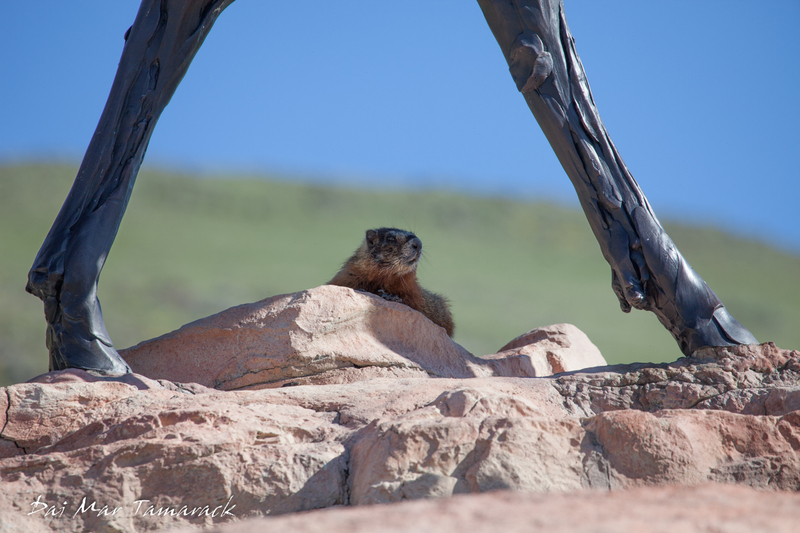 As I walked around the upper terraces of mammoth hot springs I noticed several large bison patties, which means that sometimes the large animals come in for a bit of warming at the springs. This is where I would spend my winter if I was a bison here. 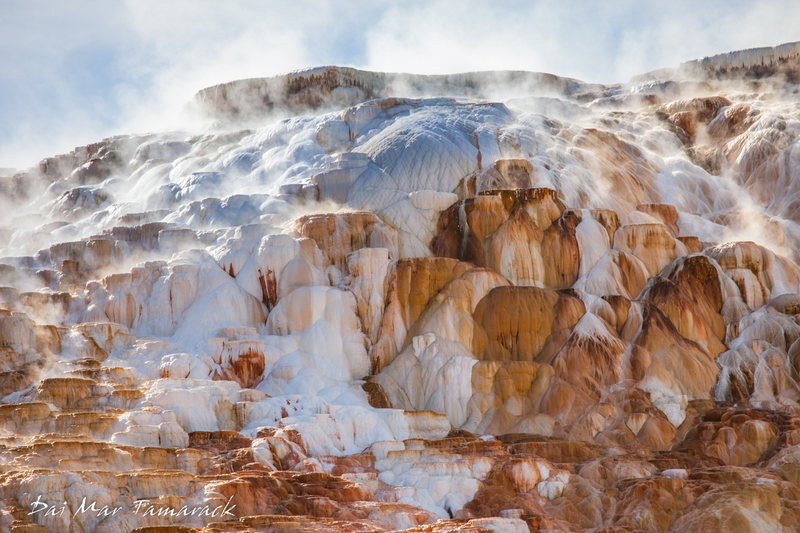 Yellowstone should definitely be on any photographers hit list. If you are looking for inspiration or a chance to shoot something new this is it. I've been lucky enough to spend a lot of time in Africa, leading safaris from Kenya down to Cape Town. One of the big draws of traveling all the way to Africa is to see and experience a place where big animals still roam, and the predators still rule. 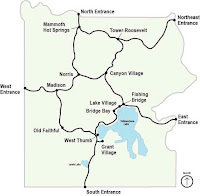 So imagine my surprise when I found out that you could have a similar experience right here in my backyard, a place called Yellowstone National Park. 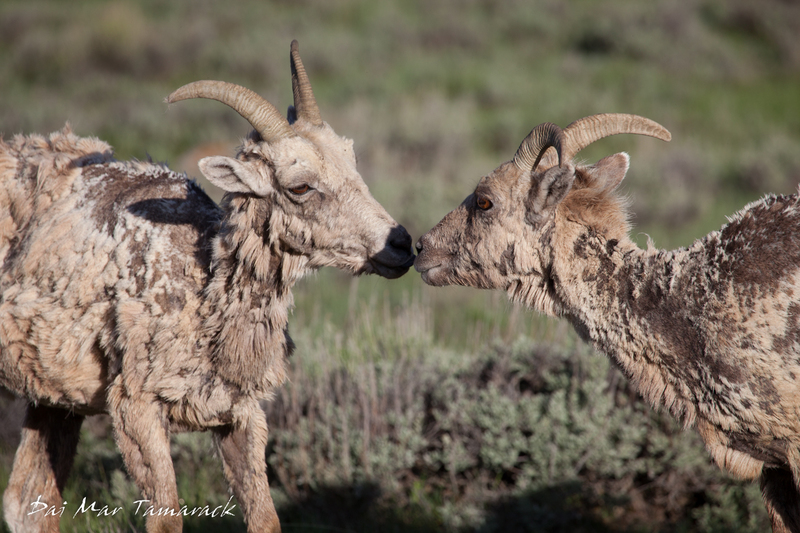 After leading adventures in British Columbia this spring I flew into Jackson Hole, Wyoming to meet up with my dad and Cheryl to go on an American wildlife safari and this is what we saw.... in one day. 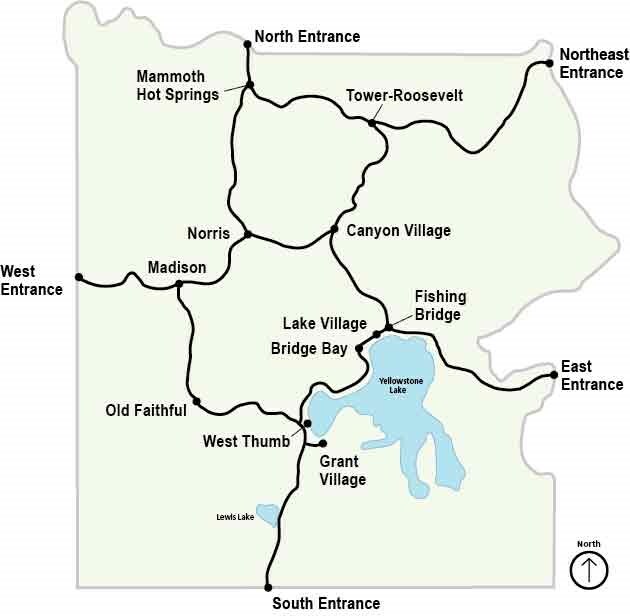 To get to Yellowstone from Jackson you drive north through Grand Teton National Park and after an hour and a half you enter the south entrance of Yellowstone. 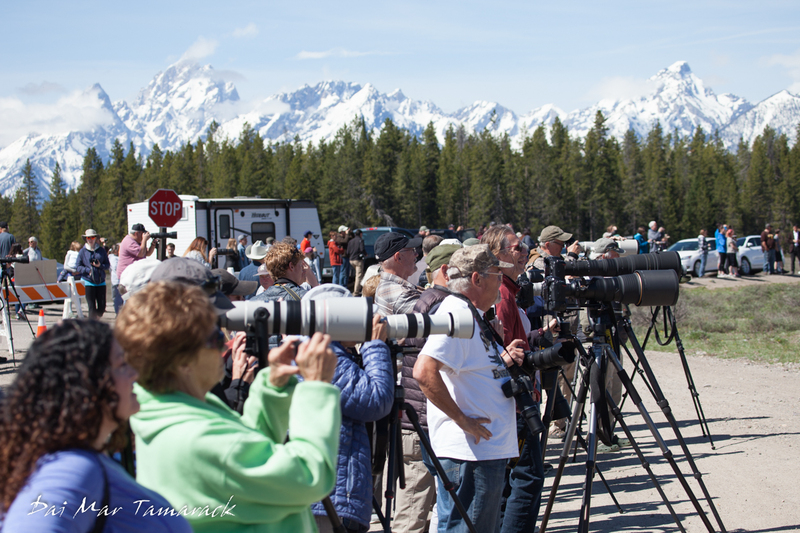 Before we got to the entrance we had already come across a major traffic jam cause by a grizzly bear near the road. 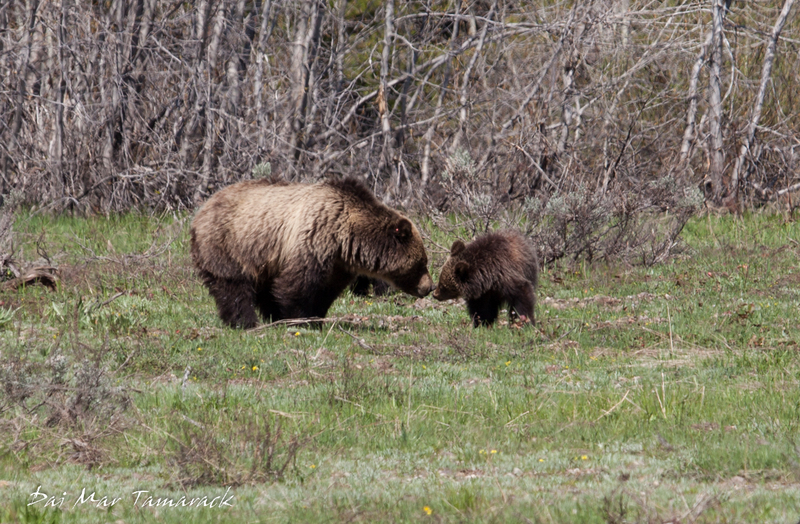 We got out and walked over to the crowd and were greeted with not one, but three grizzly bears, a mom and her two playful yearling cubs. The crowd continued to grow and I was a little shocked that the rangers allowed everyone to stand just seventy yards away as the mom fed on grass and the cubs ate daffodils in between playful wrestling matches. I though about managing hiking groups in Alaska in this situation and that is only a group of ten! But the bears continued to act like bears and didn't seem to mind the camera filled crowd. 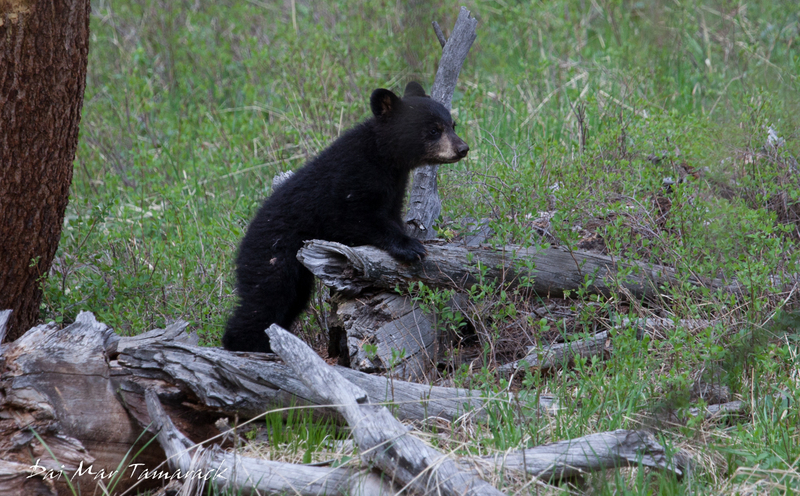 While we watched the grizzly mom and cubs we heard that there was also a black bear up around the corner. 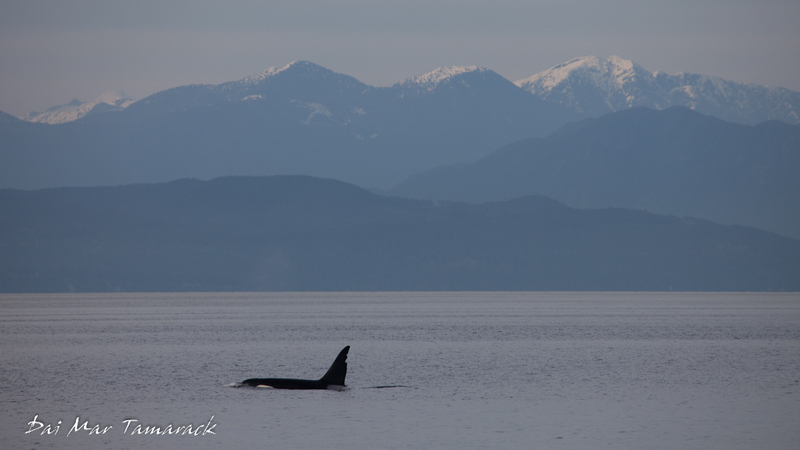 It is fun to be in a place where both species lives side by side. 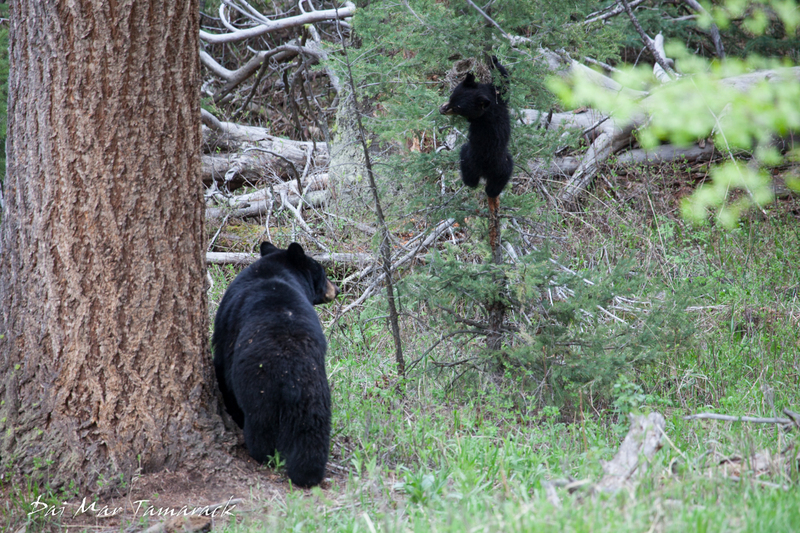 We missed the black bear but we did have an even better black bear encounter up near Tower in the park. 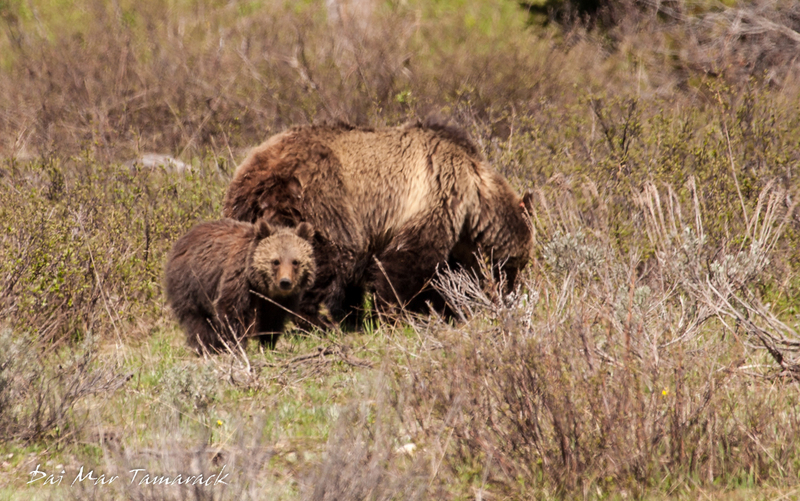 A mama bear and her tiny cub were slowly moving and eating about 50 yards off the road down a little slope. 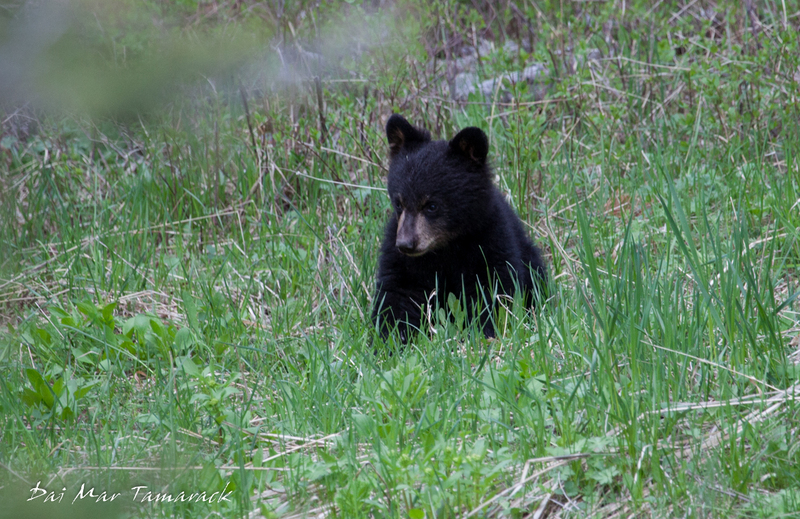 We stayed up on the side of the road looking down and watched the energetic baby bear race back and forth past her lumbering mom. The cub tried to climb a big tree trunk twice, but aborted each time. 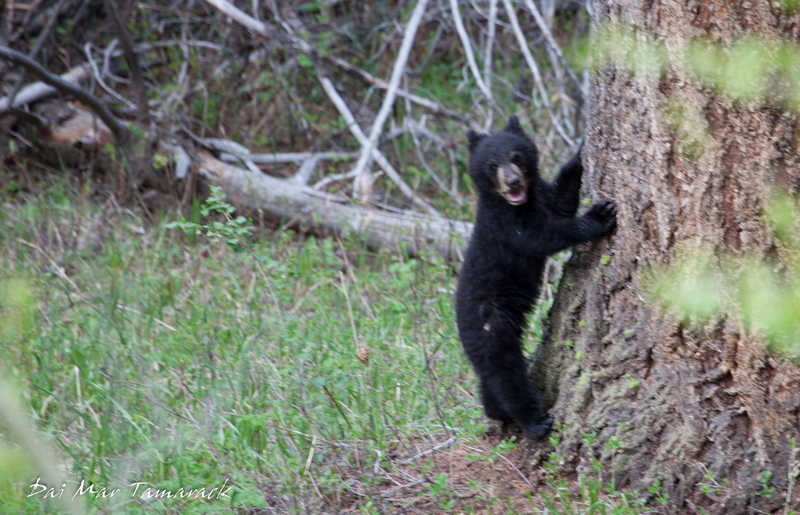 Then the curious cub found a little sapling pine tree and scampered up it. To its surprise the bear found a robins nest in the tree. I don't think it knew quite what it had found, so while the cub spent a lot of time examining the bright blue eggs in the nest it didn't eat them in the end. The concentration of big mammals in the park really made me feel like I was back in Africa. 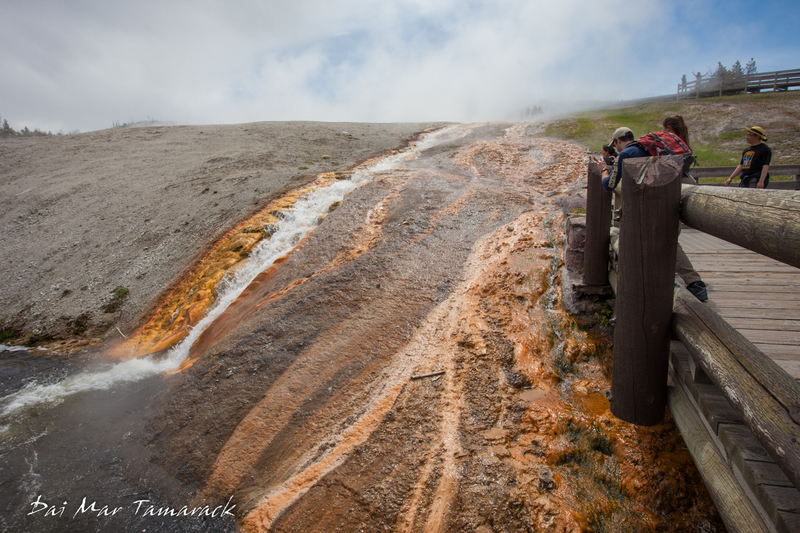 Then you add the beautiful scenery and all of the geothermal volcanic activity and it turns into a must see for anyone. 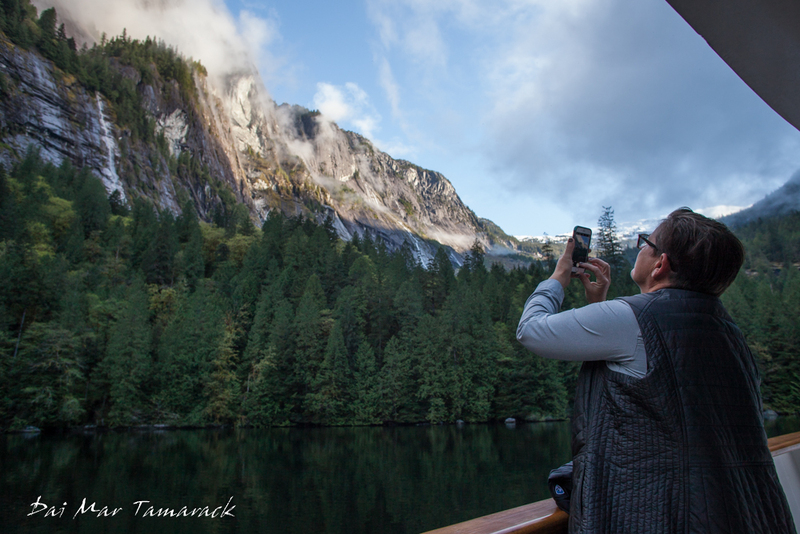 It is a World Heritage Sight and a Biosphere Reserve, and quite important historically as it is our very first National Park. It contains 67 species of mammals and is great for birding as well. 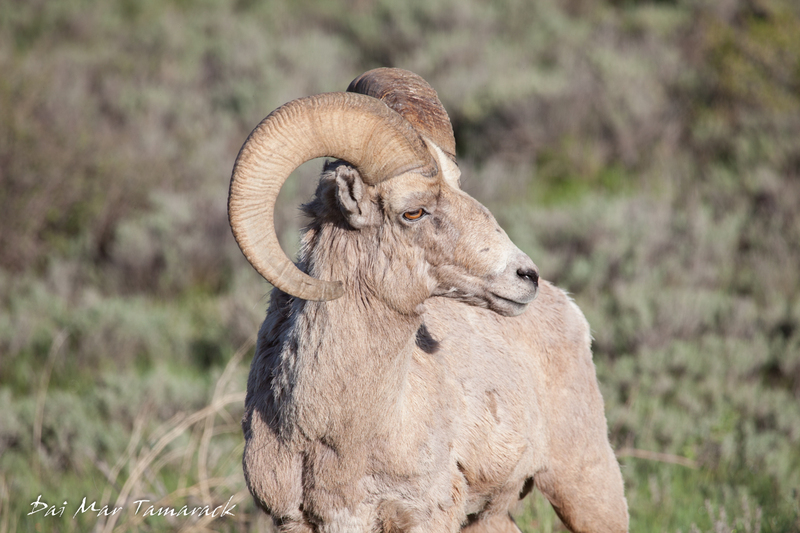 Some of the species we came across are big and charismatic like moose and big horn sheep. 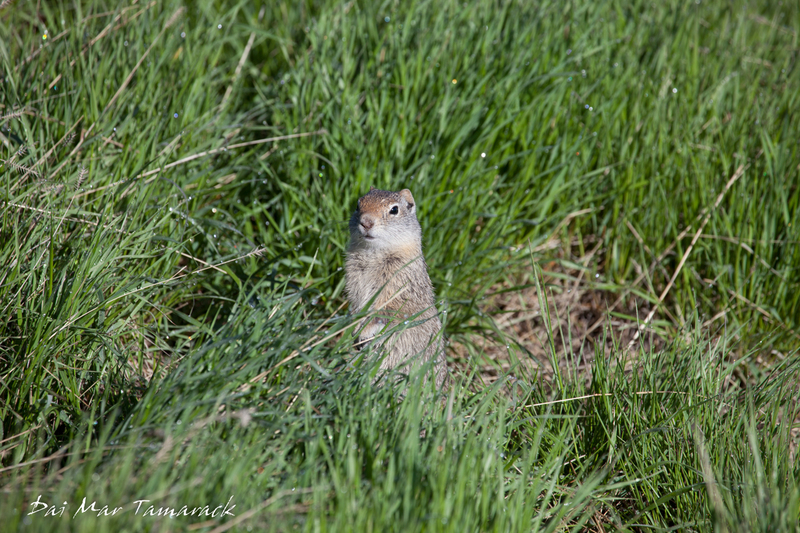 But smaller mammals can also steal the show from ground squirrels to yellow bellied marmots. 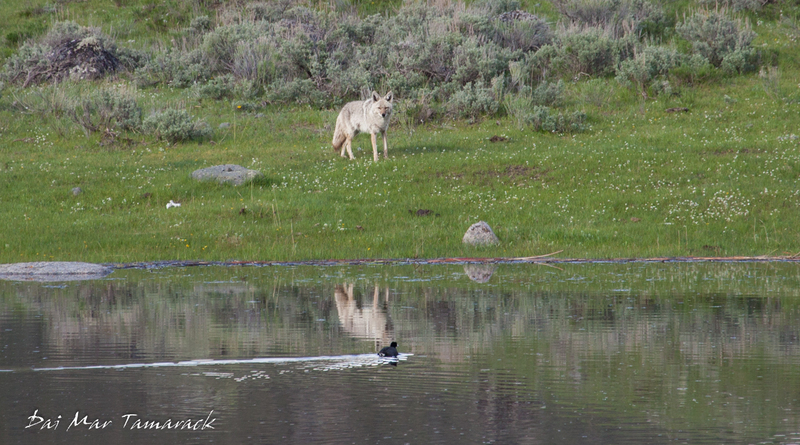 Elk can still be seen in large herds and wolves draw a large following of 'wolf watchers', who bring out chairs and spotting scopes to watch them from across valleys. 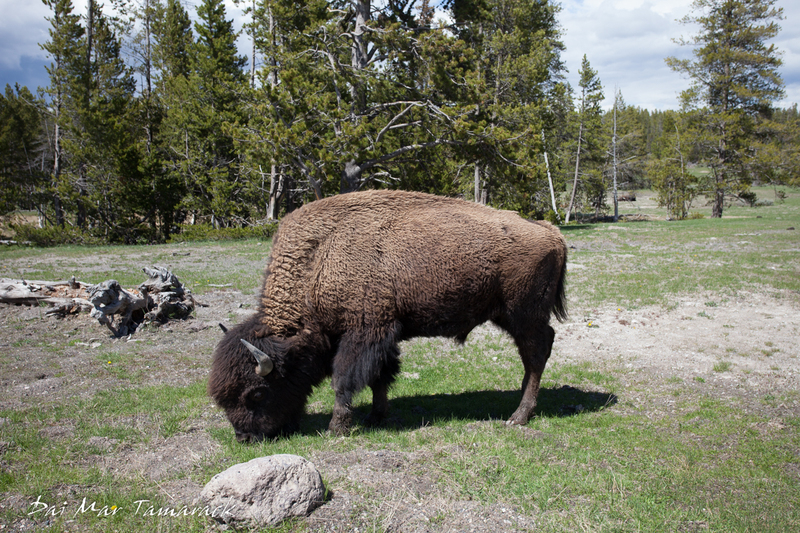 One of the most idyllic sightings in Yellowstone are the herds of massive bison, or American buffalo, that still dot these rolling plains. 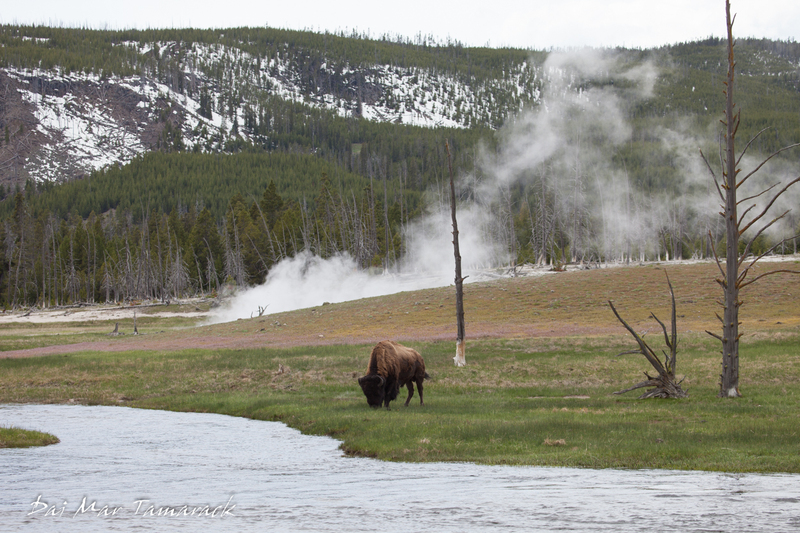 This picture of a bison eating near a river with steam from a hot spring in the background is a vision of Yellowstone that I won't forget. For the most part these are docile creatures interested only in mowing down the grass. 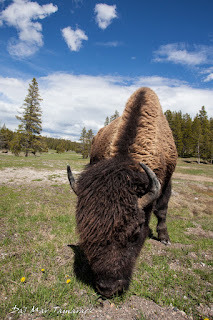 However this has lulled visitors into a false sense of safety in the past and every year some person gets too close and ends up getting tossed by a bison. I made sure I didn't make that mistake, so this wide angle picture below was taken by sticking my camera out of the window from the safety of our vehicle. But it does show how close this bison came to us! 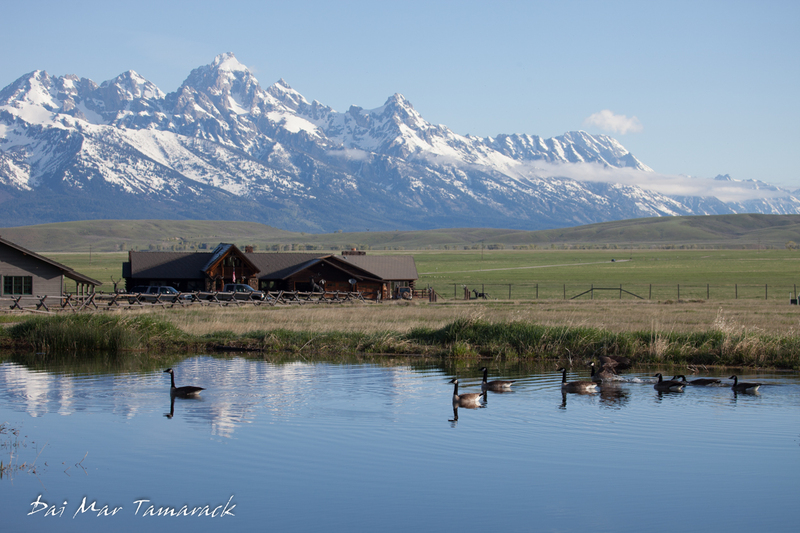 Tucked in between the Teton Range and Yellowstone National Park, the town of Jackson Hole provides some of the most amazing backdrops. Landing in Jackson Hole airport has got to be one of the most picturesque place to fly into. 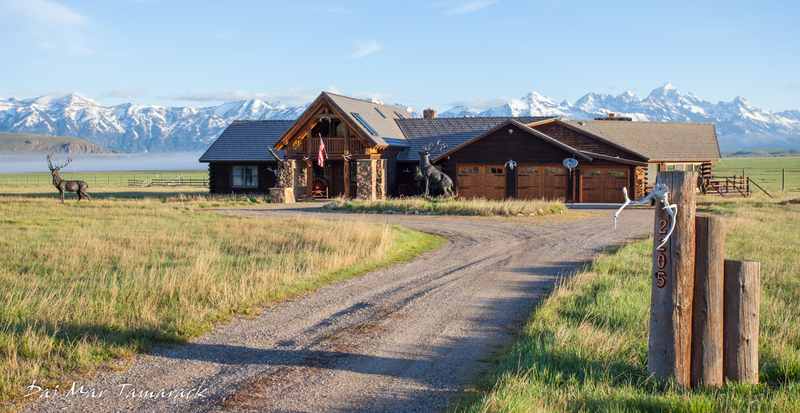 I was still soaking in the beauty of the Tetons meeting the plains when I rolled up to a sprawling log cabin that I thought may be a museum with all the bronze statues in the yard. Then I realized that this is the house I'm staying at for the next few days. 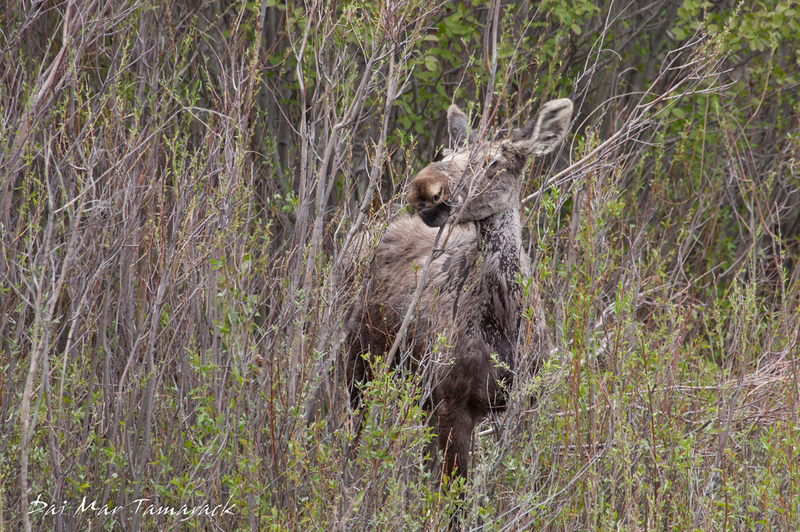 We were in the middle of the Elk Refuge, although they all move out after the winter. 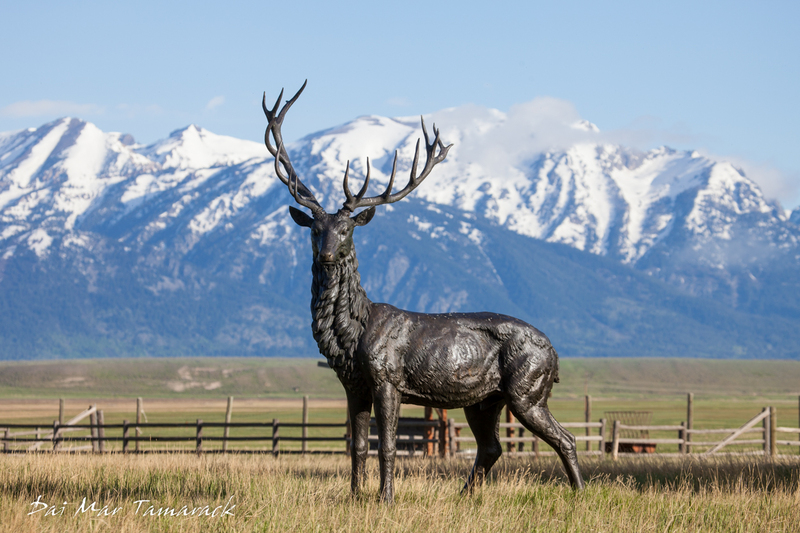 A few of the bronze statues depicted what it must be like in the winter, although I have to admit I will take the nice spring weather and look for the elk elsewhere. 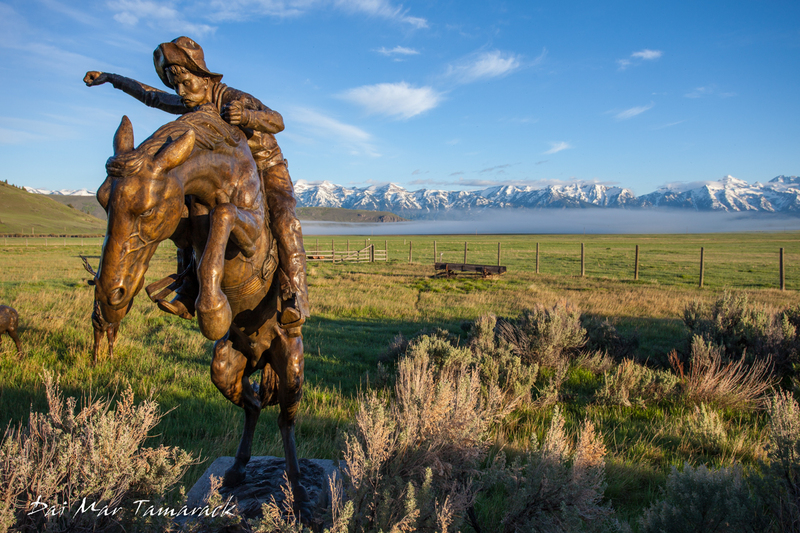 One of the statues depicted a cowboy on a bucking horse which I learned is one of the main symbols of Jackson Hole. The real elk also left a clue of their passing, having broken off one of the antlers from a bronze elk statue. 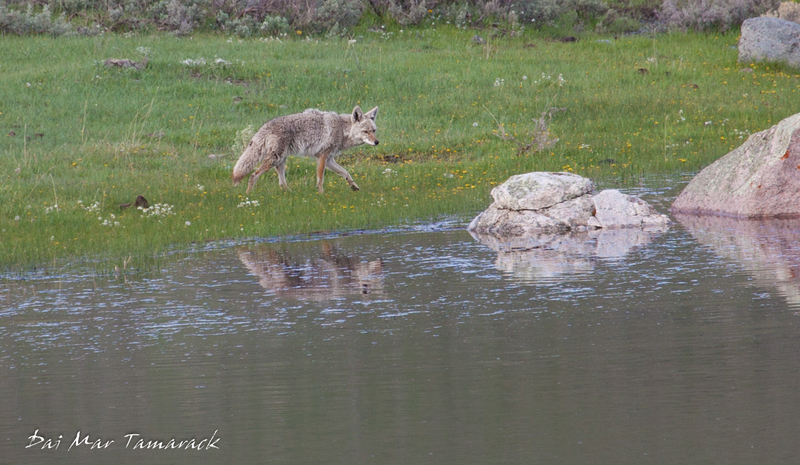 I can't wait to start exploring Yellowstone, the Tetons, the Snake River and more here in Jackson Hole, Wyoming. 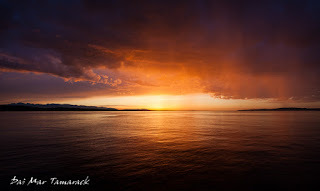 These last three weeks I have been sailing through the Salish Sea which is the vast inland sea comprising Puget Sound, the Strait of Juan de Fuca, and the Strait of Georgia. 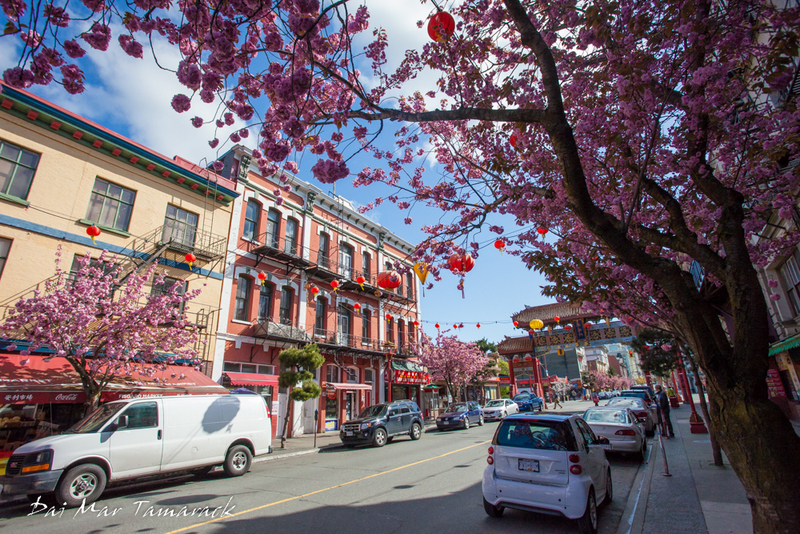 We have had some of the most incredible spring weather I've seen in years. 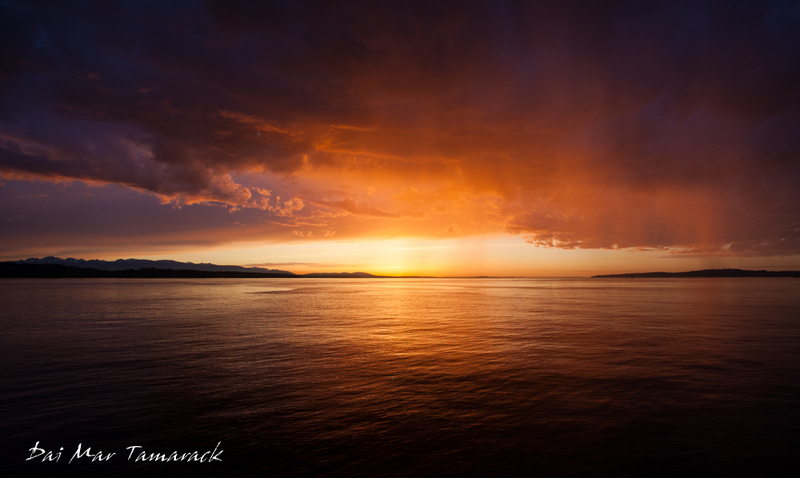 Sunsets like this have been gracing us just about every night and there is no better way to enjoy them than to be sailing off into them. More updates on these adventures will come, but the excitement for Alaska season is drawing near. Springtime is a wonderful time to cruise the Pacific Northwest. It is the calm before the summer boating storm which brings all the pleasure cruisers out from the Seattle hibernation. It is times in the Spring like this where we have secret coves and bays all to ourselves for kayaking, bonfires, hiking, and skiffing. 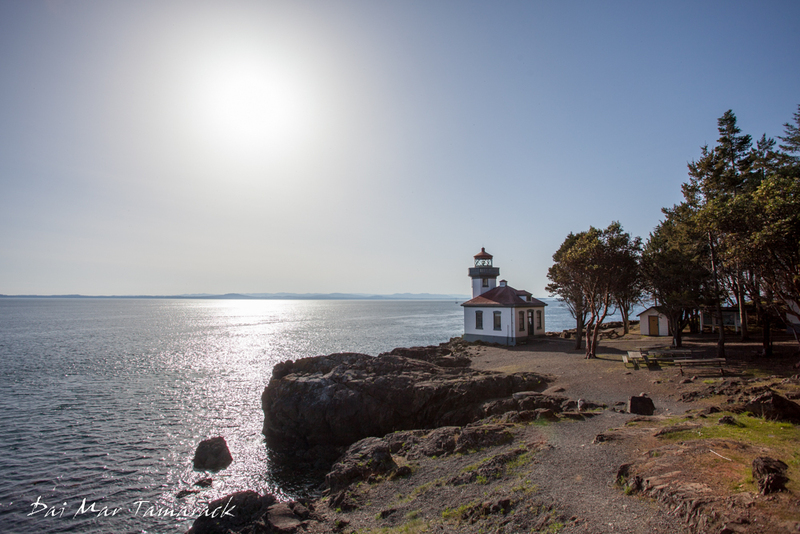 Wildflowers are in full bloom, unusual birds are migrating north on their way to different parts of Alaska, and sightings of transient killer whales and grey whales are possible. It is one of the best kept secrets of this area, and now you are in the know. See you out here.